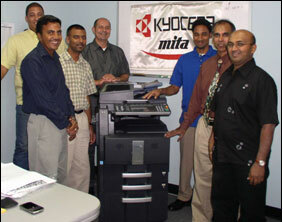 Business Equipment and Interiors International Ltd. hosted a Kyocera Taskalfa colour MFP technical training session for both local and overseas technicians. The training session was over a course of four days and was conducted by Mr. Jose Alberto Olivo who is an International Product Support Specialist from Kyocera. The training session was geared to equip the technicians with technical knowledge about the new TASKalfa colour MFP on the following models 500ci, 400ci, 300ci and 250ci. The technical training has advanced the technicians knowledge and capablilties. It has awarded them with Kyocera Technical Certification upon the completion of both technical training and examination. All technicians can proudly return to their respective companies having the technical knowledge to fully operate the Kyocera TASKalfa colour models.